After a break over the festive season things are now back in full swing not only with arrangements at Raku Dining but also with my own studies. I completed Textbook 4 and have made my first entre into the lessons from Textbook 5! This is an exciting development as the fifth textbook was only officially introduced in 2017 and that means I am among the first few batches of students to really tackle the new textbook and all the exciting challenges it represents. Of course other students around the world are also at the same stage but I suspect that they are equally excited in tackling the new material. 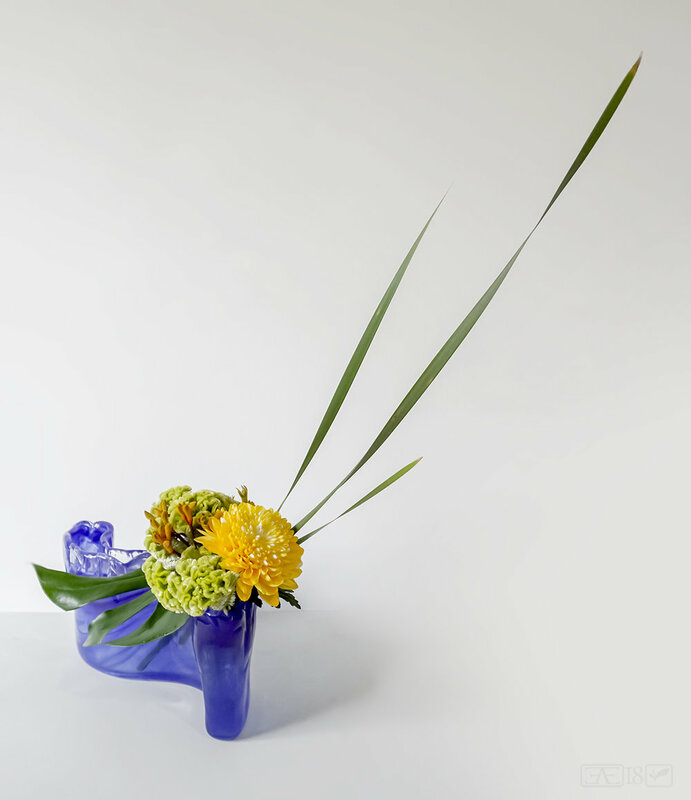 The final classes of Textbook 4 were to create a celebratory arrangement and to make an arrangement that expresses "Ikebana and you", pictures follow below. For the celebratory arrangement my teacher encouraged me to find an occasion that was out of the ordinary to make an arrangement for as it's so often the case that we see arrangements for birthdays, anniversaries and the standard festive times of year... In this case it is for an anniversary but it is celebrating the 85th year of Lego! So with this theme of course I decided that I needed to make my container out of Lego blocks which was lots of fun. I found the Ikebana and me arrangement to be more of a challenge than expected my first attempt was an ok kind of arrangement but I feel I had overthought the assignment a little bit and I fell prey to the shopping list approach - this represents x, and this represents y, etc... at the time it felt right but in retrospect the overall result felt a bit disjointed and jumbled, perhaps I am being a little hard on myself but in any case I wasn't completely satisfied. I suspect my teacher got a similar feeling although she was very diplomatic and gently suggested that I have another try because I had lots of time left and it might be fun to see what else I might produce with the materials on hand. I was much more satisfied with the second result which is the one that I have shown here. In the first class of Textbook 5 we ended up looking at lessons 2 and 3 chosing to leave lesson 1 till a little later in the year as it was about seasonal materials and being the very height of summer much of the material available presently only provides limited options. So lesson 2 was a technical lesson about using vertical fixing techniques. I created an arrangement in an interesting container using twisted willow and some amaranthus which had a sense of freedom and wildness to it that I enjoyed very much. Lesson 3 was about creating an arrangement for a table setting. I had a couple of tries at Lesson 3 as I had some time to spare. The second attempt was a bit more light hearted and had in mind that it might be an arrangement for a study group, hence being arranged on a cork board.